become CLC and at Throstle Nest with the CLC mid Cheshire line that provided access to Manchester. A CLC through route between the two cities was thereby created which opened on 2 September 1873. The 1865 Act also made provision for a spur from Glazebrook to Skelton Junction which linked with another CLC line and gave the MR direct access to Liverpool avoiding Manchester. It opened with the section of line from Glazebrook to Cressington Junction a month earlier than the main line on 1 August 1873. Halewood station opened the following year and first appeared in the timetable in May 1874. 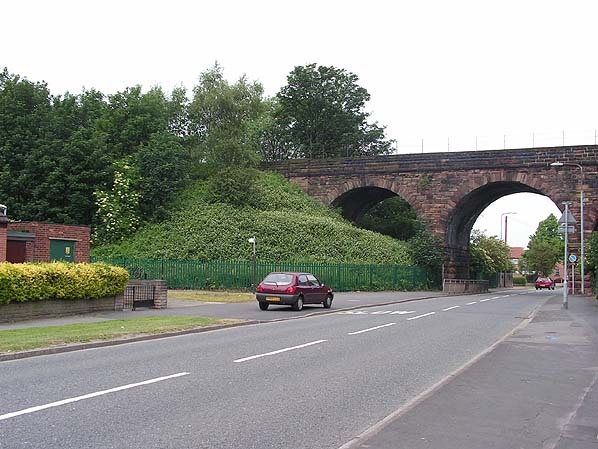 It was located on the south side of the village of Halewood on the west side of Baileys Lane over which the line passed on a three-arched sandstone viaduct. The station was high up on an embankment, and for this reason it was constructed from timber (unlike nearly all of the other CLC stations which were palatial brick structures). The line was double-track and the station was provided with two platforms. Austere single-storey timber buildings with shallow, hipped roofs and flat awnings were located on each platform. A footbridge was provided at the east end of the station. Access to the platforms was via a sloping path that led up from Leathers Lane to the up platform. Passengers crossed to the down platform via a barrow crossing. .
London Road, a joint LNWR/MS&LR station. (The CLC opened a station of their own, Manchester Central, on 1 July 1880). The CLC partners had their access to Liverpool but by the 1870s new docks, capable of accommodating larger ships, were being created on the north side of the city; the CLC wanted access to these docks. Although the docks were only a few miles to the north of Liverpool Central, to build a line directly to them would involve expensive tunnelling under the city centre. A cheaper alternative was to build a line to the east of the city from Halewood via Gateacre, Knotty Ash, West Derby and Walton to Aintree. From Walton a branch would run down to the north docks at Huskisson. The line was authorised on 30 July 1874 as the North Liverpool Extension Line. The North Liverpool Extension Line connected to the main line west of Halewood station. 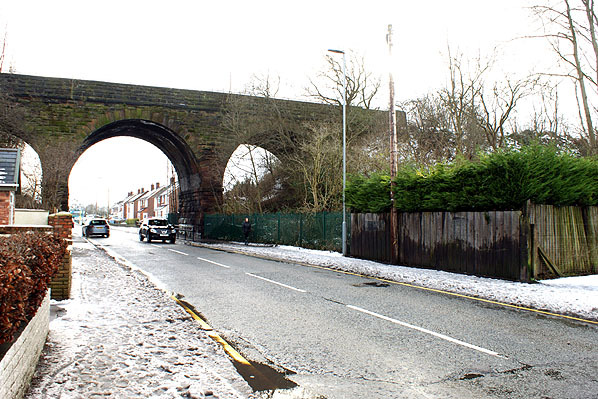 It had two connections: an east-facing junction (Halewood East Junction) 6 chains to the west of the station and a west-facing junction (Hunts Cross East Junction) 1 mile 9 chains to the west. The lines from each of the junctions converged at Halewood North Junction which was 75 chains from Halewood station via the east-facing junction. A triangle was therefore created at Halewood, and sidings were laid within it to facilitate the operation of goods trains. 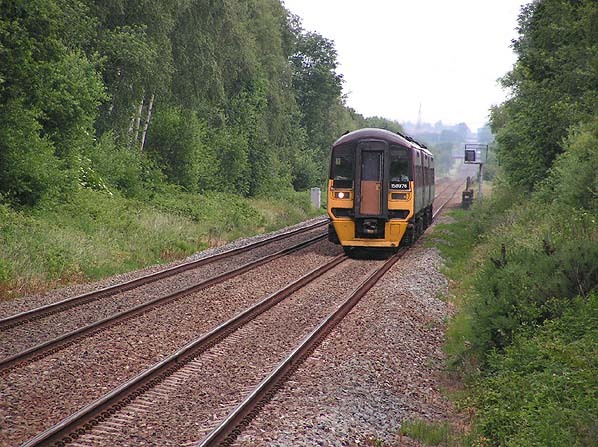 The North Liverpool Extension Line opened between Halewood and Walton-on-the-Hill on 1 December 1879. On 1 July 1880 the line to Huskisson opened, and goods services began to operate on the North Liverpool Extension Line. The line between Halewood East Junction and Hunts Cross West Junction was quadrupled in 1883.
between Southport and Manchester, and many of them called at Halewood. By December 1895 Halewood was served by fifteen up and fifteen down trains Monday-to-Friday as shown in the table below. On Sundays there were five trains in each direction. Halewood was advertised in the timetables as an interchange point for passengers travelling between the main line and the Southport line. On 1 August 1897 the MS&LR changed its name to the Great Central Railway (GCR). In 1897 a new spur was opened between Halewood East Junction and Halewood North Junction to the east of the original line. The line was provided primarily for passenger services and fast freight. The original line became a freight-only line, and the arrangement created a triangle within a triangle. 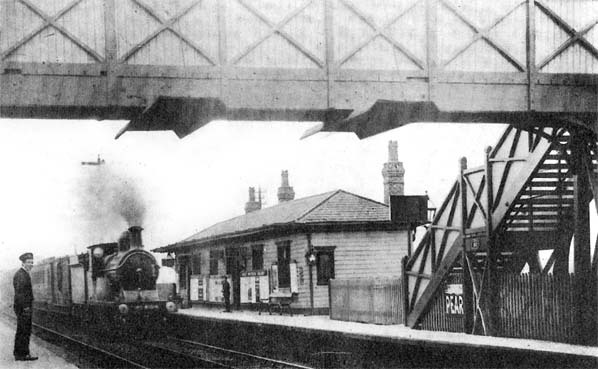 By the early 1900s a footbridge had been provided at the east end of the station. The line was a busy main line railway and the CLC obviously had concerns about passengers having to cross it to reach the down platform. The July 1922 timetable showed Halewood as having eighteen up and twenty-one down trains on Monday-to-Friday as shown in the table below. There were four in each direction on the main line only on Sundays. On the 1 January 1923 the majority of the railway companies of Great Britain were grouped into the ‘Big Four’. The CLC remained independent, but its parent companies became the London Midland Scottish Railway (LMS) with one-third of the shares and the London & North Eastern Railway (LNER) with two-thirds. The footbridge was removed in the 1920s. A footpath was created that ran from the down platform to the station entrance by passing under the line at the Baileys Lane bridge. The LMS summer 1932 timetable showed Halewood as having ten trains to Liverpool, three to Mananchester, two to Southport and nine to Warrington on weekdays. On Sundays there were three up and five down trains. During the Second World War passenger services were cut back, but the line was extremely busy with freight and also with troop trains. 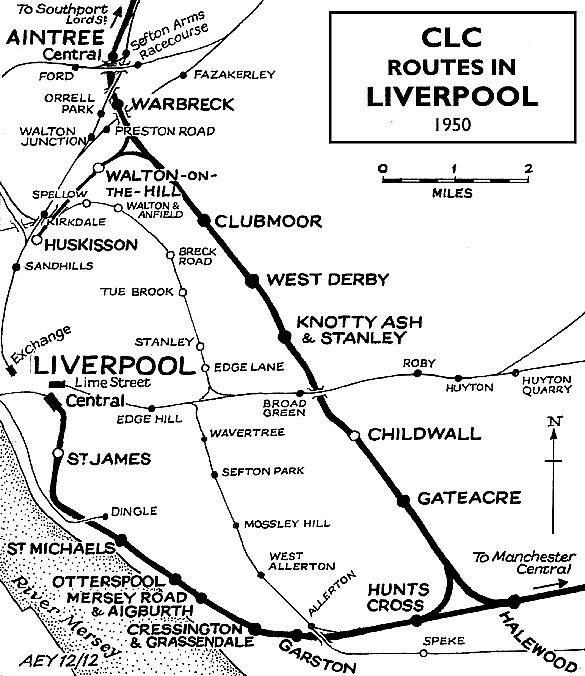 The North Liverpool Extension Line was especially so as it linked with the north Liverpool docks. Extra sidings were laid out within the Halewood triangle to accommodate the extra traffic. On 1 January 1948 the CLC became part of British Railways London Midland Region. The 1949 summer timetable showed Halewood as having fifteen up and fifteen down trains Monday-to-Friday as seen in the table below. There were no trains on Sundays. The CLC lines were very busy at this time but Halewood station, which served only a small village, was unremunerative. British Railways closed it completely on 17 September 1951. Being a timber station its demolition left little trace. 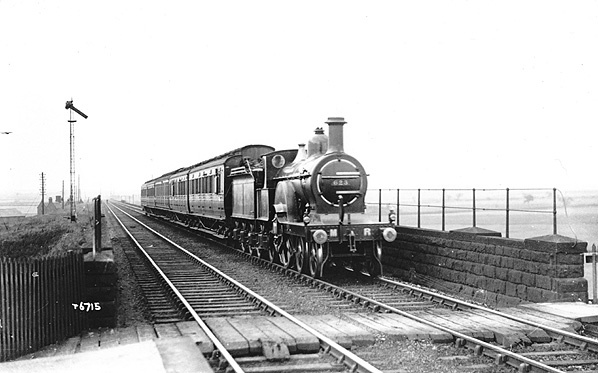 On 7 January 1952 the line between Aintree and Southport closed to passenger services. 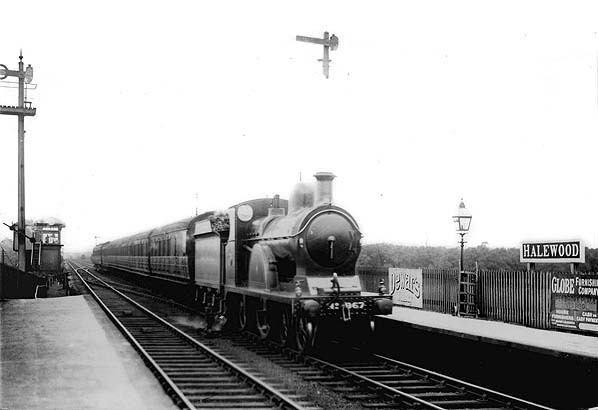 Passenger trains continued to pass between Halewood East Junction and Halewood North Junction as part of a Manchester Central – Aintree Central service until 5 November 1960, but after that date it was used only by race-day specials and excursions. A new signal box had opened in between the main line and the Halewood North spur on 21 October 1962.
earlier, on 14 May 1967. Halewood East signal box, having only the main line to control, survived until it was burnt down on 26 October 1981. In the 1960s and ‘70s large areas of social housing were built to the south of the main line and to the west of the triangle. In the 1970s areas of private housing were built on the north side of the line around the original village. It was clear that Halewood warranted a railway station once again. A new station opened to the west of the original at Hollies Lane on the site of the Halewood East Junction on 16 May 1988. The Halewood triangle was laid out as a public park in the later part of the 1980s. The name of Halewood is best known for the major car factory opened by Ford in 1963 which, since 2008, has been the Jaguar Landrover plant owned by Tata. This complex is rail-served, but by the ex-LNWR route between Liverpool South Parkway and Runcorn, and is about a mile south of the past and present Halewood stations. For other stations on the Liverpool to Manchester CLC line click on the station name: Liverpool Central, Liverpool St. James, Brunswick, Otterspool, Garston, & Manchester Central. Looking east along the up platform at Halewood station in c.1912. A train is seen heading west with a Great Central Railway locomotive at its head. Halewood station shown on a 1893 map. The station had no footbridge at this time and aceess from the road to only the up platform. 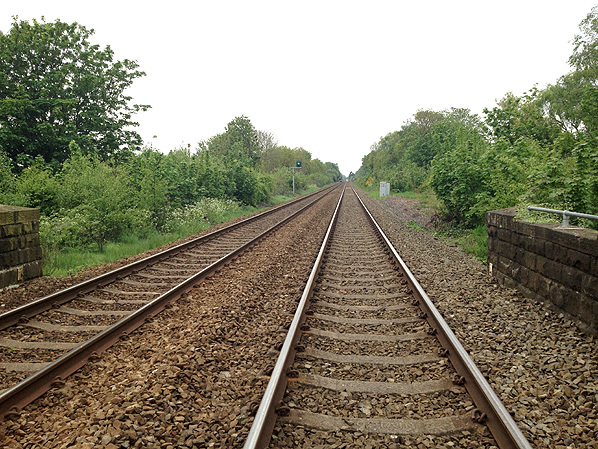 Passengers would have had to cross the line via a barrow crossing. By 1907 a footbridge had been provided at Halewood at the east end of the station. The CLC obviously considered it too dangerous to allow passengers to cross a busy main line. the down platform to the station entrance. 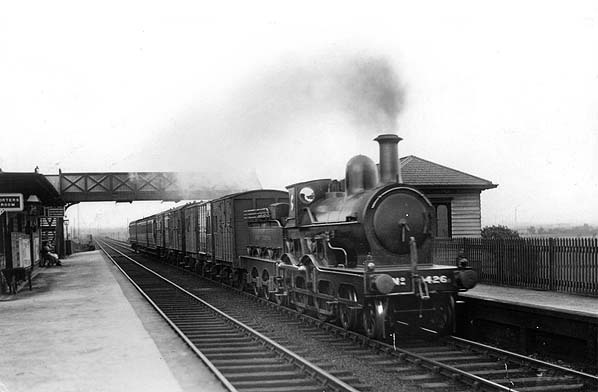 An express train is passing eastwards through Halewood station in the early years of the twentieth century. Towards the rear of the train the points of Halewood East Junction can be seen and, to the left, its controlling signal box. The box was a CLC type CL1a dating from 1 December 1879. It had a 32-lever frame and controlled the main line, the junction with the North Liverpool Extension Line and access to the Halewood sidings. It lasted until 21 October 1962. Looking east from the eastern end of Halewood station's up platform in the first decade of the 20th century as an express train for Liverpool Central thunders through. Halewood station looking west from the down platform in the early years of the twentieth century. The site of Halewood station looking east from the east end of the 1988 station in June 2006. Marking the location of the down platform is a Liverpool-bound 'Trans Pennine Express' service. from the other side of the bridge. this view from 26 January 2013. 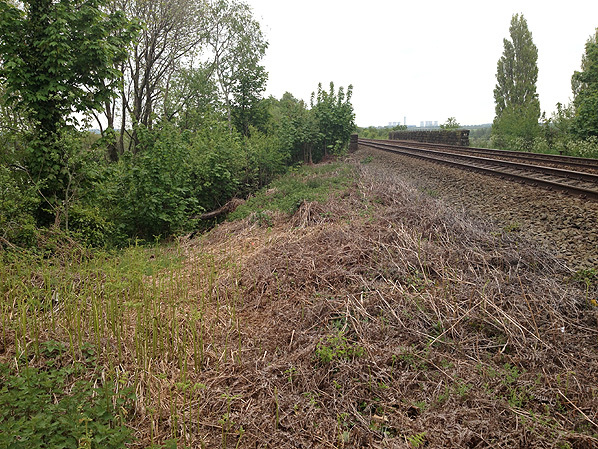 The site of Halewood station looking west in May 2013. Looking down the pathway that connected the up platform at Halewood station to Baileys Lane in May 2013. The bridge over Baileys Lane can be seen in the middle distance.